If you’re wondering what could possibly have happened that made this week so crazy, it was mostly a bunch of little things that happened all at once after I got home on Wednesday. But the biggest thing was I had the opportunity to second-shoot a wedding with Sean Flanigan, an incredible photographer here in Seattle. And what a nice guy—so humble and chill. Shooting with him was so easy and I took a lot away from the whole day. I’m looking forward to sharing those images with you in a couple weeks, but in the meantime, check out Sean’s work. It’s just stunning. I did a simple Google search, “bridal boutique seattle”, and several results came up. I began reading through reviews and a couple stores really stood out to me. While it’s helpful to read the reviews, I think it’s so important to be objective when reading them. I’m not overly dramatic but I know some girls who can be, so what might be a “so-so” experience for me might be “horrific and awful” for someone else. I looked for reviews that were authentic and well-written, which I think is fair when considering which stores to go shopping. If it’s a negative review but it was composed well and thoughtful, then the likelihood that the shopper’s experience was indeed that bad is probably true. But the same can be said about positive reviews. So please keep that in mind. My name is Carly and I’d like to make an appointment to try on some dresses. I’ve never tried on a wedding dress before and am more than just slightly dreading the process. I’ve lost a significant amount of weight but even though I’m a ‘normal’ size 10, I’m still scared of how shopping for a dress will affect my self esteem. I’m not even sure what style would look good on me, which is why I’d like to make the appointment. I’ve read some positive reviews on your boutique and am hoping for a positive experience. I want to point out a few things about my email because I think they can really help you when booking your future appointments. Notice I started out very casual and light-hearted, immediately putting myself in a “first name” context because I’m really looking for a professional AND friendly experience. I also explained my current circumstances. At that point, I had really never tried on a real wedding dress or been dress shopping and I wanted the boutique to know this! Why? Because I need a little hand-holding through this process, that’s why! And why shouldn’t I? Picking out a wedding dress can be very emotional time, which can turn really bad, really fast! So yes, I told the boutique about my weight issues, my self perception problems, and my lack of knowledge about dress styles. Because I’m going to need help through this and I’m hoping they can! Lastly, notice that I mentioned “reading some positive reviews”. I think it’s important for the boutique to know that I’ve done my research and that I’m a review-reader, which also means I could be a review-writer. And trust me—they want a positive review. So there’s even more incentive to please, you follow? Thank you for your inquiry. 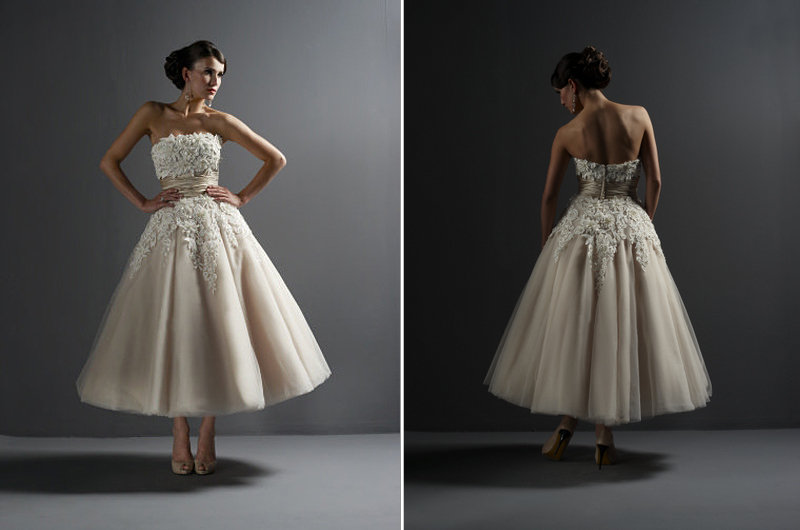 We would love to set an appointment for you to look at gowns here in our shop. Is there a particular date/time that works best for you? We know that wedding dress shopping can be a nerve-wracking experience, but we try to make it as pleasant as possible here. Our samples range from size 6 to 24, with most in the size 10-14 range. Most of our consultants have been in the industry for years and are very skilled in helping you to pick out beautiful styles that will flatter your figure. If you have any special concerns, please feel free to share them with your consultant when you arrive. Please write back when you get a moment and let us know which day/time works best for you. Have a great rest of the weekend! Wow! I was impressed! Not only had I received a fast response (it was the first message in my Inbox the morning after I wrote my email) but it basically addressed every point in my original email. She called me by my first name, she asked what date/time works best for me (which isn’t always the case), and she even acknowledged how “nerve-wracking” dress shopping can be! Way to be real, Jen! I immediately felt better about making my appointment, knowing they had such a wide range of sizes and styles, and having the reassurance that if I had concerns, the experienced consultants were there to listen and assist. You might think I made a mountain out of a mole hill when it came to this issue, but if you’re not concerned about the dress, maybe it’s the location. Or your makeup artist. Or the caterer. Whatever it is, I think several of the principles apply. Be open, be honest, and don’t just go with the top of the Google search results (because they really don’t mean anything other than they’re probably really good at Search Engine Optimization). Brittany stood behind me, holding up THE dress. You could see the stars in my eyes (just like in the cartoons)! “OhmygoshIlovethat,” I said in one, short breath. At that, Brittany had gathered a handful of dresses for me to try on, saving the One for last. I was so excited to try it on, but I’m glad I tried the others first. It only proved that the last one was The One. Getting in and out of dresses was easy. Brittany was there, clamps in hand, and I never felt like a “big girl”, even when the sample dress was too small. I stood in front of the mirror with other girls trying on dresses, girls I’d never met, and stood confidently. Even when I didn’t like the dress I had on, I didn’t suffer a major blow to my self esteem. I didn’t think, I don’t like me in this dress. Rather, I thought, I don’t like this dress on me. I finally had the experience I always wanted and never had. Not because I couldn’t have it before but because I was too afraid to look for it. And now that I’ve had the experience, I wouldn’t replace it. I love it! Did you get it in those colors as well? I love those colors!